(CNSNews.com) - Manufacturing jobs in the United States hit their highest level since President Barack Obama was inaugurated in January 2009, according to data released today by the Bureau of Labor Statistics. In January 2009, according to BLS’s seasonally adjusted numbers, there were 12,561,000 people employed in manufacturing in the United States. In February of that year, the number of people employed in manufacturing dropped to 12,380,000—a one-month decline of 181,000. In July 2017, according to BLS preliminary seasonally adjusted numbers, there were 12,425,000 employed in manufacturing. That is up 16,000 from the 12,409,000 who were employed in manufacturing in June and is the largest number of people employed in manufacturing in any month since January 2009, according to BLS. At the same time, jobs in local, state and federal government increased only 4,000 in July, rising from 22,354,000,000 in June to 22,358,000 in July. The 22,358,000 jobs in government jobs in July outnumbered the 12,425,000 jobs in manufacturing jobs by 9,933,000. BLS has published government and manufacturing job numbers going back to 1939. 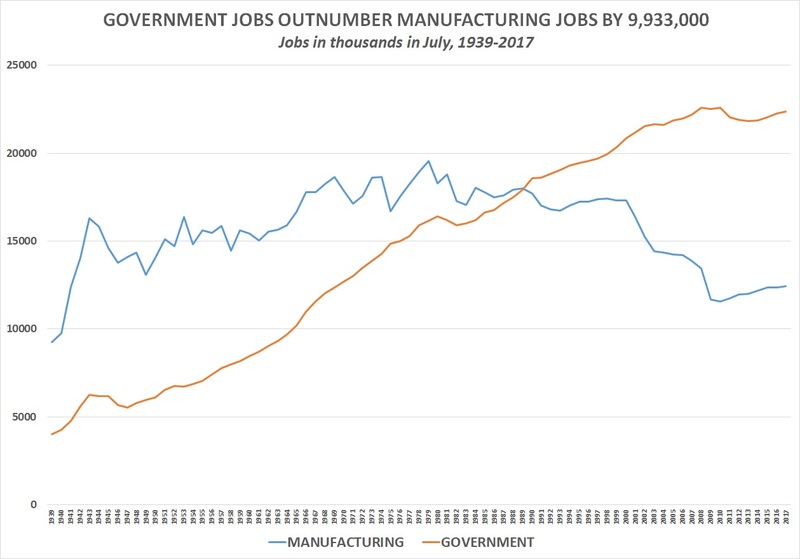 Until 1989, manufacturing jobs in this country exceeded govenment jobs. Then, in August 1989, government jobs for the first time moved ahead of manufacturing jobs--17,989,000 to 17,964,000. Since then, goverment jobs have exceeded manufacturing jobs. Manufacturing jobs peaked at 19,553,000 in June 1979. The 12,425,000 manufacturing jobs in the United States in July was 7,128,000 below the peak. During Obama’s presidency, manufacturing employment would never again rise to the 12,561,000 number it stood at in the month he was inaugurated. By February and March of 2010, employment in manufacturing would drop to an Obama-era nadir of 11,453,000—a decline of 1,108,000 from Obama’s inauguration month. When Donald Trump was inaugurated president in January 2017, employment in manufacturing stood at 12,355,000—or still 206,000 below the level when Obama was inaugurated eight years before. In July, according to BLS preliminary seasonally adjusted numbers, there were 12,425,000 people employed in manufacturing. This is still 136,000 below the level of manufacturing employment in the month Obama was inaugurated—but it is the highest level of manufacturing employment since that month and 70,000 more than the 12,355,000 employed in manufacturing the month Trump was inaugurated. In its numbers released today, BLS said that the preliminary seasonally adjusted manufacturing employment number for June is now 12,409,000—meaning the 12,425,000 employed in manufacturing in July was an increase of 16,000 from June. “Employment in mining was essentially unchanged in July (+1,000),” said BLS in its press release. “From a recent low in October 2016 through June, the industry had added an average of 7,000 jobs per month. "Employment in other major industries, including construction, manufacturing, wholesale trade, retail trade, transportation and warehousing, information, financial activities, and government, showed little change over the month,” said BLS.